The defense chiefs of South Korea and the United Arab Emirates are to hold talks Wednesday, as the two countries seek to improve defense cooperation following the decision to establish a strategic partnership earlier this year. According to the Ministry of National Defense, Defense Minister Jeong Kyeong-doo will meet with his UAE counterpart Mohammed bin Ahmed Al Bowardi. He serves as the UAE minister of state for defense affairs. The meeting is designed to focus on expanding cooperation in defense partnership and military procurement. South Korea is one of the major exporters of weapons to the UAE and South Korea’s military is in the UAE training the country’s special forces unit. “We expect the meeting will become an opportunity to further enhance trust between the countries’ defense authorities,” the Defense Ministry said in a statement. During President Moon Jae-in’s visit to the UAE in March, the two countries decided to establish a “special strategic partnership.” According to Cheong Wa Dae, the UAE is the only country in the Middle East with which South Korea has such a relationship. It came after the two sides mended ties following controversy over a secret military agreement. The pact is said to have included a controversial clause that would require South Korea to intervene militarily to protect the UAE in the event of a contingency. Faced with mounting criticism that South Korea could be mired in conflicts in the Middle East, Defense Minister Jeong said last month the government cannot send its troops “automatically” without parliamentary approval. “There is no such thing as automatic military involvement,” said Jeong, responding to a question by opposition lawmaker Rep. Kim Jong-dae, who claimed that South Korea’s Special Forces unit stationed in the UAE could be involved in regional conflicts. 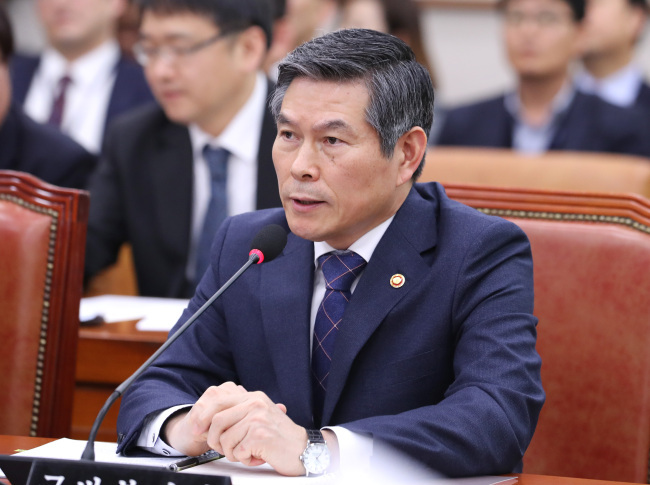 Last week, the parliamentary committee on national defense approved a proposal to extend the stationing of the South Korean Special Forces unit for a year. Since its initial deployment in 2011, the Akh unit has engaged in training the UAE’s special forces and conducting joint exercises. About 150 South Korean military personnel are currently stationed at the Akh unit.